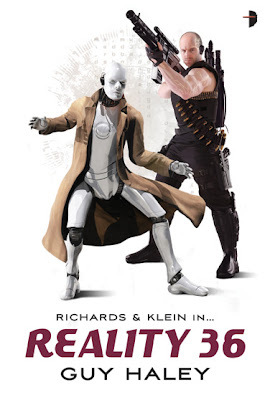 One Sci-Fi debut that has been on my radar is Guy Haley's Reality 36, which is the first in the Richards and Klein Case series. The duo is supposed to be a futuristic team ala Sherlock Holmes and Watson. Richards is the Holmes-like AI who jumps around robot bodies with his partner the muscle bound cyborg Klein bringing, well obviously, the muscle. When I first heard about the series it interested me since I enjoy Sherlock stories even in pastiche form. And then I saw the cover and lost a bit of interest due to the muscle head on the cover. Flash forward a couple month to now. 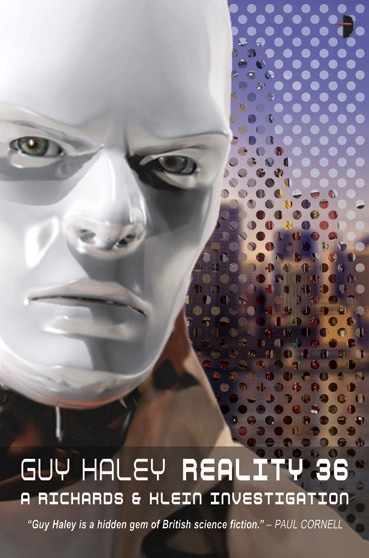 I still kept the book on my watch list because sometimes it is best to look past the cover and lo and behold Angry Robot has switched up the cover design. Apparently, I wasn't the only one who didn't care for that particular version. Still present is the nicely rendered Richards. Again let me point out how cool the category tag/descriptions Angry Robot uses. Haley is also hard a work on a novel called Baneblade for Black Library and Champion of Mars for Solaris that should see the light in 2012. So you can certainly say he has been keeping himself busy since the demise of the much loved Death Ray magazine, which he edited. This is the first I've heard of Reality 36. If I had just seen the first cover I definitely would have passed, but the new one does interest me. But do we need more Sherlock rip-offs? Big improvement! I'd pass on the first book, but stop to check out the second. @Alex It all depends on what the author can do with them. Mann seemed to make them his own. So far I haven't seen too many future Holmes & Watson takes. Although Matt Hughes'Henghis Hapthorn novels come to mind.